Use Unit Builder to interact with your unit materials, learning experiences, and assessments in one consolidated interface, allowing you to visualize and review your entire unit at once. The Unit Builder interface is straightforward and efficient, transforming the process of unit design and set-up from multiple steps in different tools into simple one-step actions. Unit Builder also extends instructional design guidance provided by the Instructional Design Wizard by implementing and displaying the blueprint you create in the wizard. 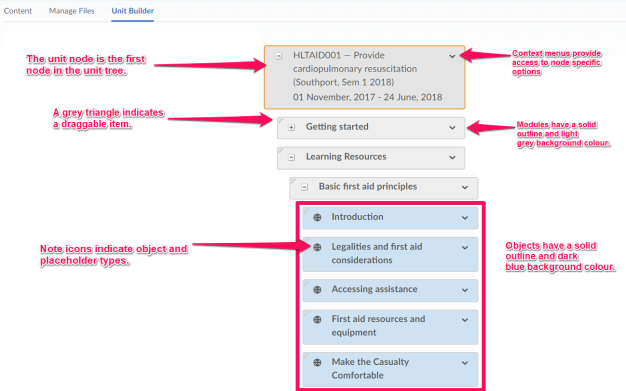 If you decide not to use the Instructional Design Wizard, Unit Builder still enables you to incorporate instructional design best practices when planning your unit. As you build your unit outline with modules and placeholders, you can add notes to each module and placeholder summarizing your unit goals and learning objectives. When you are ready, you can populate your outline by creating appropriate lessons and activities within Unit Builder. Each structure element in the unit tree is called a node. Node is a general term that can represent a module, placeholder, or object. A module is an organisation element that can represent different chapters, or topics of your unit. You must create a module in Unit Builder before you can begin adding objects and placeholders. A placeholder is essentially a container for an object. It is not visible to learners until you add an object to it. There are five placeholder types: link, file, discussion, assignment submission folder, and quiz. Placeholders help you define the structure of your unit before you are prepared to compile actual unit content. This enables you to plan your lectures, discussion topics, assignment submission folders, tests, and other unit activities before you begin creating them. You can populate placeholders when you are ready by creating new content or linking to existing content. For example, if the completion of a particular unit topic depends on acquiring files from another resource, drag placeholders into the unit tree to represent those files until you receive them. Objects are simply learning materials, activities, or assessments in your unit. Object types include: links, learning objects, HTML files, discussions, assignment submission folders, quizzes, and grade items. When you create an object in Unit Builder, you are in effect creating it within its respective tool and adding it to your unit content. 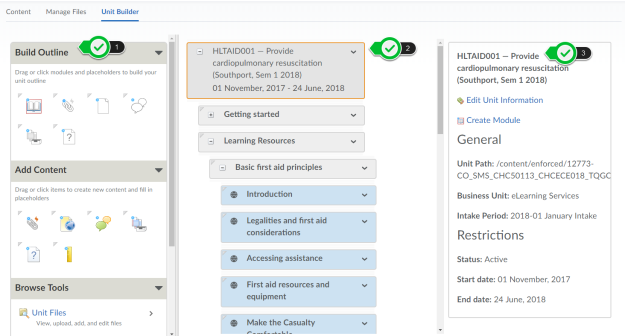 For example, when you drag a quiz object into the unit tree from Add Content, Unit Builder prompts you to enter its basic details and creates the quiz in Manage Quizzes. At a later time, you can go to Manage Quizzes to edit advanced quiz properties and add questions. The unit tree represents unit content as a hierarchy of nested nodes. The appearance of each node denotes its type, the object type it holds, and the actions you can perform on it. The first node in the unit tree is the unit node. When selected, you can change your unit offering information in the selected node panel. The Unit Builder user interface consists of three sections. You can add modules, placeholders, and objects to the unit tree from three areas within the toolbox: Build Outline, Add Content, and Browse Tools. Build Outline provides you with module and placeholder elements that you can add to your unit tree to create your unit outline. Browse Tools displays a library of pre-existing objects in your unit tools. From Browse Tools, you can locate and add these pre-existing objects to the unit tree or drag them onto placeholders in the unit tree. This section of the toolbox features a drill-down menu with breadcrumb links that appear at the top of the toolbox as you navigate deeper into the menu. You can click on breadcrumb links to return to a previous section. The unit tree is a visual representation of your unit structure. It displays the hierarchy of your unit content as a series of nested nodes. The unit tree simplifies the process of rearranging, copying, and deleting your unit structure. Each structure in the unit tree is called a node. Node is a general term that represents a module, placeholder, or object. Each non-module node in the unit tree includes an icon indicating its type. This can help you to see what's in your unit at a glance. What is the relationship between Unit Builder and Content? As you add modules, placeholders, and objects to the unit tree, Unit Builder synchronizes with various tools within Connect, including the Content tool. When you add a module to the unit tree, the system generates a content module which appears in the Content tool. When you add a placeholder to the unit tree, the system generates an empty content topic. This content topic is hidden from the Content tool until you attach an object to the placeholder. When you add an object to the unit tree, the system generates a content topic. This content topic is visible in the Content tool. If you edit an object's placeholder name or notes within Unit Builder, you are editing the name and shared designer comments of the corresponding content topic within the Content tool. To see how Unit Builder content displays for learners, from the tool navigation, access the Content area. Drag a module or placeholder into the unit tree in the location you want. Click on a module or placeholder element. From the Select a location dialog, click on the location you want to add your module or placeholder. Enter the module or placeholder details. When you create an object in the toolbox or drag a new object into the unit tree, Unit Builder interacts with its tool, enabling you to populate basic information and attributes. This streamlines the process of setting up your resources so you can focus on developing your unit. From the toolbox or selected node panel, you can launch an object's corresponding tool to complete and finalize its details. Drag an object type into the unit tree in the location you want. Click on the object type you want to create. From the Select a location dialog, click on the module or placeholder you want to add your object to. From the Browse Tools section of the toolbox, locate the existing object you want to add to your unit. Drag the object you want to add to your unit into the unit tree in the location you want. Select the check box beside the object you want to add to your unit structure and click Add to Unit. From the Select a location dialog, click on the module or placeholder you want to add your object to. After adding activity objects (discussions, Assignment submission folders, and quizzes) to your unit structure, you can associate them with evaluation objects (grade items). If an evaluation object is already associated with an activity, that association appears in the evaluation object's details when you browse objects. At the same time, an activity object displays grading details when it is associated with an evaluation object. Drag an evaluation object type onto a discussion, Assignment submission folder, or quiz in the unit tree. Click on the evaluation object you want to create. From the Select a location dialog, click on the discussion, Assignment submission folder, or quiz you want to add your evaluation object to. Enter your evaluation object's details. From the Browse Tools section of the toolbox, locate the existing grade item you want to add to your unit. Drag the evaluation object you want onto a discussion, assignment submissions folder, or quiz object in the unit tree. Select the radio button beside the evaluation object you want and click Add to Unit. From the Select a location dialog, click on the discussion, assignment submissions folder, or quiz object you want to add your grade item to. Deleting or moving files, links, discussions, assignment submissions folders, and quizzes within their tools can result in broken objects. If an object breaks, Unit Builder displays a broken link status icon within its node. The object becomes a placeholder retaining its name and notes. To repair a broken object, drag an object from the toolbox onto the placeholder.